Chance is you have a Facebook account. And if you do, you are likely using a few apps or playing some games on the Facebook website. Most users who do, load the games and apps after they have logged in. That's not overly handy. It is on the other hand possible to bookmark games or apps to open them more quickly, especially if they are placed in the bookmarks bar, speed dial or new tab page. The Firefox add-on Facebook Application Bookmarks steps it up a notch by allowing users to synchronize all games and apps that they have subscribed to on Facebook with their Firefox bookmarks. While that's usually not something for Facebook users with less than a handful of apps or games, it could be a welcome aid for users who regularly use new apps and games on the social networking site. The biggest feature, without doubt, is the ability to synchronize all apps and games, which means that new apps and games are added to the bookmarks, and old apps that have been removed on Facebook are also removed from the bookmarks. So how does it work in detail? The extension adds a new entry to the Firefox bookmarks. The new entry, Facebook Apps, displays several options right in the menu, not only Facebook apps and games. No apps are listed after installation of the extension. The menu has direct links to Facebook messages, events, photos, notes and groups. 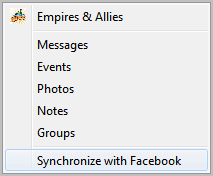 A click on Synchronize with Facebook updates the bookmark folder. Apps and games that have not been listed yet are added, and removed programs are deleted from the listing. This works incredibly well. All it takes to sync all Facebook apps with the bookmarks is a single click on that entry. The user needs to be logged in to synchronize the bookmarks with the apps, but that is rather obvious. Facebook Application Bookmarks is a handy add-on for heavy Facebook users who work with the Firefox web browser. Interested users can download and install the add-on directly over at the Mozilla add-on repository.